Why Do I Get Numb Toes in my Running Shoes? Why do I get tingling feet in lace up shoes? 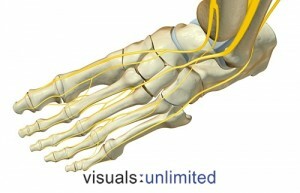 The top of the foot has a cluster of nerves that run lengthwise from the leg to finish in the toes (see Diagram). In the midfoot, there is very little flesh over the bones. Depending on how the shoelaces are tied, the nerve can get squeezed against the bone causing tingling feet, pins and needles or numb toes. To make it better, there are two simple things to try. The first is to glue a pad of soft rubber on the underside of the tongue of the shoe, which the podiatrist will happily do for you at an appointment. The second is to change the lace arrangement to miss the third lace hole from the top (on joggers – on other shoes such as boots, you’ll have to use that level as a guide). Run the lace from the 4th hole on the left to the second hole on the left. Do likewise on the right except also duck through the left loop. Use lace-locking lacing technique at the final holes near the ankle. See Podiatry FAQ How Do You Do Lace Locking? to learn how.